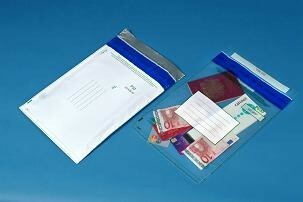 Postsafe, a range of sturdy, single use, tamper evident security envelopes. They are also known as security tamper evident bags (STEBS) and typically used for transporting valuable or sensitive goods or documents. Available in white opaque or clear polythene. Weatherproof, waterproof, burst tear and puncture resistant. Double peel & seal, tamper evident enclosure. Sequentially numbered with matching tear off receipt tab. Suitable for traditional and new airport security applications. Accepts handwriting, stamps and franking. Code. Colour. Internal size (mm). Need a customised version ?? Contact us now. Perhaps you are looking for a reusable security envelope or bag ? ?